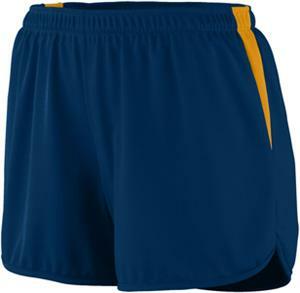 Augusta Sportswear Ladies Velocity Track Short. 100% polyester wicking knit. Wicks moisture away from the body. Ladies' fit. Heat sealed label. Covered elastic waistband with inside drawcord. Matching inner brief with leg elastic. Contrast color side inserts. Side vents. 4-inch inseam. Waist (on half) 14" 14 1/2" 15" 15 3/4" 16 5/8" 17 5/8"
Hip (on half) 19 3/4" 20 3/4" 21 3/4" 23 1/4" 25" 27"
These are great shorts, I use them for Inline skating both in and out door. Very lite weight!